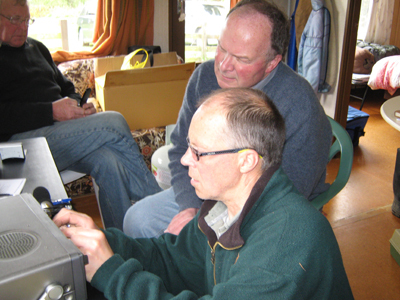 In October the Mosgiel DX contingent of Ian Wells, Phil Garden and Jon Wood gathered for their 4th annual DXpedition to Waianakarua. They were joined by Paul Aronsen who also made the pilgrimage last year. DX preliminaries kicked off on Monday the 18th with Paul and Linda Ormandy spending a couple of days (and very cold nights!) at Waianakarua. We woke to a very heavy frost on Tuesday and headed home for Wednesday night. Paul Aronsen arrived for lunch on Thursday and confessed to having only a Digitech AR1747 radio, fortunately Stu Forsyth’s AR7030+ had been sitting here awaiting his impending return from overseas. So it was pressed into service and performed very well. Ian and Phil arrived mid-afternoon on Friday and Jon around the same time on Saturday. 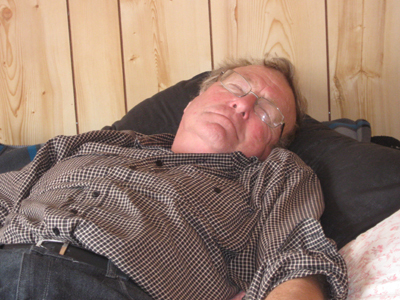 Jon primed himself with very strong coffee so when he left at midnight he would stay awake for the return journey to Mosgiel. Reception conditions on MW were variable. Peruvian stations thumped in every night with 1570, 1540.5, 1470, 1400, 1360, 1130, 1010 and 880 provided the most regular signals. Yanks were not strong and there was a general feeling that there was something amiss with the antenna. One day the balun feed was replaced to no avail and next day re-doing the end termination brought no improvement, so we assumed there must be a break or bad join somewhere along the 310m run. That will be a project for another day. 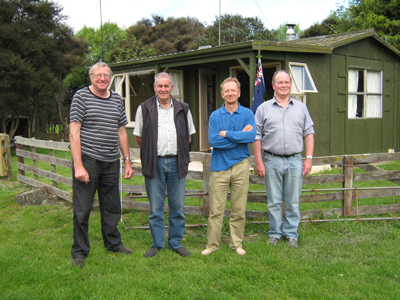 Even so, US signals on the EWE were also very flat and Bryan Clark in Mangawhai also reported similar US reception. Reception on shortwave was phenomenal with some good catches to be had in the now under-utilised bands. Brazilians were audible on 25mb from as early as 1900z and still there at 0900z. Africans in the morning on 49 and 41mb were also very good. Zanzibar on 25mb, Equatorial Guinea and Argentine Antarctic on 19mb were the pick of the higher frequency catches. We packed up Sunday morning with planning for the 2014 Oktoberfest already beginning. Waianakarua Oktoberfest 18-20/10/2013. Present: Paul Aronsen, Ian Wells, Phil Garden, Jon Wood and Paul Ormandy. Receivers: Kenwood R1000 x 2, Sangean 909, AOR AR7030+, Lowe HF150 & Kenwood TS2000. Antennas: 425m Beverage aimed at South America, 20m groundplane, EWE, 10m groundplane (North Amwerican Beverage has a break somewhere… needs more detective work and sweat! ).